A rich, comforting dish that’s perfect for autumn evenings. 1. Heat the oven to 220 ̊C, gas mark 7. In a large bowl, toss the squash with the olive oil and season. Arrange in a single layer on a baking tray and roast for 25-30 minutes, turning halfway, until soft and caramelised in places; set aside. Meanwhile, bring the milk to the boil with the bay leaf, cloves, peppercorns, onion and celery. Take off the heat and set aside for a few minutes to infuse. 2. Turn down the oven to 180 ̊C, gas mark 4. Make a bechamel sauce by cooking the butter and flour in a small pan over a low heat for 2-3 minutes. Strain the infused milk and add, in 4 or 5 batches, whisking to incorporate each time. Bring to a simmer and cook for 5-7 minutes, whisking regularly, until thickened. Add 1⁄2 the stilton, season and set aside. 3. Meanwhile, blanch the kale, in batches, in a pan of boiling salted water for 30 seconds or so, until wilted. Refresh immediately in cold water and lightly squeeze dry. 4. 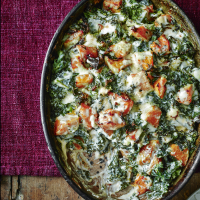 Toss the squash, bechamel and kale together in a large bowl, then arrange in a large ovenproof dish (about 2 litres in volume). Sprinkle with the remaining stilton and bake for 25-30 minutes (ideal for the second cooking of the pork belly), until golden brown. Leave to cool a little before serving.